Steve Long has a reputation in the pen-and-paper RPG business. When I first met him, I was told he was a writing machine. Maybe it's more apt to say that Steve Long, the mild-mannered game designer, is the secret identity for a super-powered writer capable of producing a book's worth of text in a single bound. Today, he's the creative shot-caller behind the dice-powered superhero RPG, Champions, which Cryptic Studios is currently adapting into an MMORPG. Champions is the flagship title of Hero Games, whose many flavors of games all run on the detailed and highly adaptable HERO System rules. 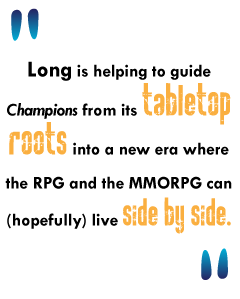 Long has been living with the game for close to 30 years now, and is helping to guide it from its tabletop roots into a new era where the RPG and the MMORPG can (hopefully) live side by side. He's a fan-turned-pro who started playing Champions in 1982 and began writing for the game when he answered a call for articles in the Hero Games house magazine, Adventurer's Club, back in 1992. "I discovered I had a natural talent for writing," says Long, "and soon transitioned from magazine articles and contributions to compilation books, and then to full books with Dark Champions in 1993." For the rest of that decade, Long says, "I think I can fairly say I was Hero Games' most productive writer; I did six full books for them, as well as plenty more magazine articles and other bits and pieces." Around 1997, when Long was dedicating himself to full-time writing and design, Hero Games went into hibernation. Except for an active fan community that never stopped playing, Champions and its sister games had stagnated. "One of the projects that never saw the light of day because the company went moribund was the Fifth Edition of [Champions], which I'd written." Long moved on but didn't forget. He worked on Star Trek and Lord of the Rings games for Last Unicorn Games and Decipher to critical acclaim, without forgetting his first love. "When the Lord of the Rings RPG won the Origins Award for Best RPG, during my acceptance speech I mentioned that I wish Christian Moore had let me do the game in the HERO System the way I'd originally suggested," says Long. "I still wish that." In 2001, Hero Games returned. Long tells it: "I was approached by my now business partner Darren Watts, who was working with a group that was putting together an offer to buy the Hero Games assets. He was just interested in getting the Fifth Edition manuscript from me under some terms, but I expressed interest in working for the company and even becoming an investor. Things were moving along smoothly when 9/11 took the wind out of our sales, leaving me and him as the only two remaining investors. After a lot of hard work and a bit of good luck, we brought in some other partners and bought the Hero Games assets in December, 2001."